Chai Spice Wisdom™ combines the health benefits of South America's "Beverage of the Gods"-known as yerbamate-and the spicy flavor and aroma of traditional East Indian chai spices. This certified organic herb tea boosts your energy and calms your nerves at the same time. It is filled with naturally occurring vitamins and minerals including carotene, A, C, E, and B complex; magnesium, calcium, iron and chlorophyll, to name a few. Athletes drink it to improve physical endurance and performance; students and executives drink it to improve concentration and alertness; families drink it to improve their overall health and to protect against stress. Chai Spice Wisdom is an excellent appetite suppressant when consumed 15-20 minutes before meals and acts as a gentle diuretic and colon cleanse. Chai Spice Wisdom may be enjoyed throughout the day on a daily basis. Bring water or milk to a simmer. Do not boil. Use one or more tea bags per cup. Steep 3-5 minutes. Serve hot or cold. 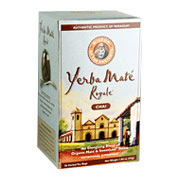 YerbaMate w/Stevia Chai Spice - is shipped in a discrete, unmarked package. Orders are processed immediately and usually take about 3 to 5 working days to be received. We do ask that you try it for 2 to 3 weeks to feel the full effects. Any information received is used only for order processing and shipping purposes. Your information, such as e-mail address, will never be disclosed to a third party.